Back in December, tipster Evan Blass leaked information about the triple rear camera setup for the upcoming Huawei P30. Citing someone who had seen the device in person, Blass' source says that the maximum resolution will be 40MP, and the device will offer a 5X lossless zoom. 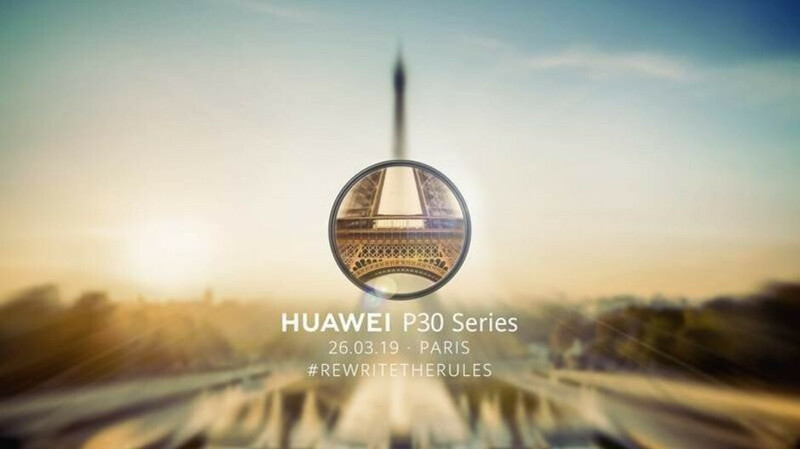 Just the other day, Huawei disseminated a tweet that includes a teaser for its March 26th new product event, that is focused on the P30's zoom capabilities. Lossless zoom means that zooming in on a subject will result in only a small drop off in the quality of an image. The teaser shows how well the zoom works. On the left, there is a picture of a forest, and on the right we see the results from zooming in on a single butterfly that can barely be spotted in the original photo. You can see that the 5X lossless zoom makes quite a difference. 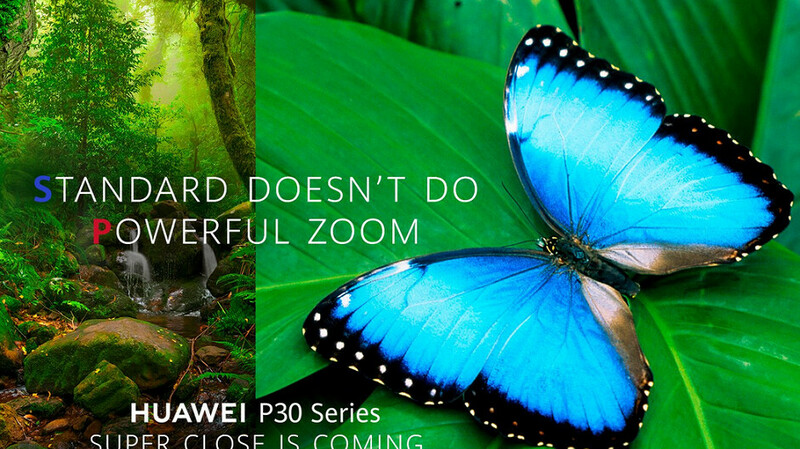 On the teaser, Huawei writes "Standard Doesn't Do Powerful Zoom," trying to point out that the P30 is more than just your average phone (we should point out that the image is a representation only, according to Huawei). Another teaser for the March 26th unveiling of the P30 models in Paris also makes a point of focusing on the new zoom feature. The photo used in this teaser shows a blurry image of the Eiffel Tower in the background; a small circle shows a focused and zoomed-in image of the tower, again hinting at the capabilities of the 5X lossless zoom. Another photo, this one taken of the moon by the P30 Pro, is also impressive. There is a good possibility that this will be the next bit of smartphone innovation to make the round from manufacturer to manufacturer. Last month, Oppo unveiled its 10X lossless zoom feature, which will be demonstrated at Mobile World Congress (MWC) tomorrow. Thanks to a huge leak that took place last month, we expect to see the Huawei P30 feature a 6.1-inch AMOLED display, powered by the home-grown Kirin 980 SoC. 8GB of RAM will be offered on this model. The Huawei P30 Pro should be equipped with a 6.5-inch AMOLED screen, and will also employ the Kirin 980 chipset. 12GB of RAM is expected on the premium unit, and both models will have Android 9 Pie pre-installed along with Huawei's EMUI 9.1 interface. If you live in the states, don't expect to see the new Huawei P30 series on your carrier's shelves. The current environment in the United States has not been what we would call "welcoming" for Huawei. Still seen as a pariah in the U.S., the company was recently indicted on a number of charges by the Justice Department. The U.S. says the company tried to defraud banks in an effort to cover-up the business it was doing with Iran. The latter country has economic sanctions imposed against it by the U.S. Huawei also is being criminally charged for stealing technology from T-Mobile related to a phone testing robot called "Tappy." The carrier already won $4.8 million in a civil suit against Huawei over the same event. In January 2018, both Verizon and AT&T planned on offering the Huawei Mate 10 Pro, which was the company's top-of-the-line handset at the time. But the U.S. government, which considers the firm to be a national security threat, reportedly put the kibosh on those arrangements. The fear is that Huawei products, both phones and networking equipment, capture personal and confidential information from consumers and corporations and send it to the Chinese government. Huawei has denied that is spies for any government a number of times. Regardless, the bottom line is that U.S. consumers have not seen any of Huawei's heralded devices available from their wireless providers, and that will no doubt be the case for some time to come. A powerful spy device ? Awesome. I’m definitely here for it. Huawei has been making some incredible flagships as of late, and some great bang for your buck smartphones with through their Honor sub-brand. They’ve also proven that, event with little to no presence in the U.S., that they can still grow sales and market share. Why use the exact same butterfly. Looks really cheap, at least be original with your ads. Why not a peacock like your logo. Gee, cheque please lol. The biggest disappointment of the previous Huawei launches has been CEO Richard on stage. Please just speak your native language and have a translator present or allow someone else to do the speaking. Other than that, Huawei has been killing the mobile photography game if albeit from a purely hardware perspective. What they're doing is on the right track though. Can't wait to see what they come up with next. Right now its either Samsung or Huawei just leave iPhone out of the picture. Actually, speaking of Cameras I think Nokia with the Penta(5) Camera setup might be the surprise for many. Yes I'm banking on Nokia turning a lot of heads after Sunday. Agreed. I think a lot of people are going to be pleasantly surprised by the 5 camera setup on the N9PV. Don't forget Sony too, Xperia 1 will come with promising triple camera setup! Based on camera comparisons the S10 isn’t head shoulders over the competition. Another Alan F article on Huawei and another article on a phones features turned into a smear campaign just like he does with every Huawei article. The guy must be on Donald's payroll, either that or someone from Huawei ran over his dog. It's funny to see the U.S. being whinny b!+¢h when they realize that China spying on them after all these years they spy and messing around on almost every single country in the world. It's funny watching you and the Huawei apologists try to justify Huawei and the fact that they are a shady company whose products aren't as well built as people think they are. What’s even funnier is you and the “I hate Huawei Brigade while falling for the U.S. Propaganda” crew attack Huawei and it’s products, all while not having used any of their recent products, so you speak from a pace of ignorance. Congratulations, you actually got a thumbs up from someone other than your other accounts. I guess jock riding is working out for you. Lmao your jealousy is noted. That haterade over your guzzling because people like my comments as opposed to what you do, thumbing up your own, is working wonders for you. Lol i can say the same about many U.S. companies. For me it's better to have 2 evil fighting each other rather than let 1 super power @$$ h°l€ do what ever they want. Right now U.S. is like a bully who whining like a b!¢+h when they gets bullied and that's very funny to see. Well I never said the US was innocent, so guess you just peed in your own Wheaties. Spot on, Byakugan. Totally agree. I am willing to "slightly" compromise on the image quality as long as the phone has 5X zoom. This looks to be awesome!